Veronika Wild: Piggies in the Trough cry " Foul"
Piggies in the Trough cry " Foul"
It would be funny if it wasn't so sad. In the lead article in yesterday's Age, Mike Smith CEO of ANZ, one of the four big banks in Australia, called for an end to "bank bashing" while announcing a $1.48 billion profit, the last of the four banks to do so, even though they have all shed thousands of jobs and raised interest rates. He also lashed out at tough new bank regulations being introduced around the world, predicting tough times ahead. Well they certainly will be. Especially for those who have lost their jobs and homes or are facing higher interest payments. We already have the highest interest rates in the world. "Give me a break! The sooner consumers/customers can get rid of overpaid pratters (try $10 million per year) like one M Smith the better off we will all be. ANZ (and the other ":big" 3) make the majority of their "super" profits from ordinary mums and dads through housing morgtages. So ANZ likes nothing better than hiking the morgtage rates to keep those huge profits rolling in at the expense of ordinary working-class Aussies trying to make a go of it. -"
"When the banks - including the ANZ - accepted the federal governments deposit guarantee as a safeguard for deposits during the GFC I do not recall the banks disputing the "politics" involved. In accepting this assistance the banks must accept that their antics would be under closer scrutiny. I for one would vote for any political party that introduced a wealth tax on their excessive profits, a job export levy for each job they create in an off shore operation that services the Australian domestic market and promises to establish a government bank to act as a further point of competition. The banks' behaviour in this country is breathtaking for its greed, its arrogance and its total failure to be enterprising. Now, one of the fat four, decides it is apt to suggest we think about the big picture. Riiiiiight....take our eyes off them for a moment and they will have their hands deeper in our pockets." "Here's an idea, which will save ANZ 10 million dollars, so it'll help us on mortgages, and save 1000 jobs................................... outsource the CEO to India"
Mostly such comments reflect the helpless anger being felt by people struggling with mortgage payments, small business owners, or retirees watching their life savings dwindle away. I would say that Mr. Smith and friends are fortunate that bank bashing is confined to verbal outrage here and that most Australians are too busy trying to pay their mortgage, watching sport or just too apathetic to burn and loot. Nor are these feelings confined to Australia. People have voted with their feet on the Bank of America and there are petitions on the web addressed to bank mangers and governments as far away as Iceland and Scotland to curb excessive greed and corrupt management practices. Might I suggest that if bank executives wish to win back some trust, goodwill and credibility, they should immediately do as the executives in a large multinational I worked for did in the seventies.To avoid having to sack people during a downturn, they immediately took a 10% pay cut themselves. Perhaps not just politicians, but bank managers should spend a few weeks on the dole or the minimum wage and see how tough it is. How dare someone on $10 million a year suggest Australian wages are too high? Hate to break it to Mr. Smith that they have to be to cover the ridiculous cost of housing and mortgages in this country. Yet I do agree with the much maligned Mr. Smith in a way. Yes, we should stop bank bashing and do something about it instead. Here are a few things you might try. Call for a tax on outsourcing. If we keep doing this, of course our economies will continue to contract, imposing more pain on everyone else. Vote with your feet as many Americans have by moving your accounts to building societies and co -operatives which operate for the benefit of members rather than shareholders. 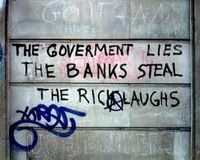 By the way, whatever happened to the people's bank owned by the Government,which used to keep the other three in line? The banks are private companies who pay themselves massive bonuses on top of the huge salaries they receive. At the same time they are taking taxpayers money to pay off their debts. None of the bankers have been prosecuted over the collapse of the financial industry even though it was caused by massive fraud. Because of their criminal and irresponsible behaviour thousands of people have lost their homes, their jobs and their standard of living. If these austerity measures continue thousands more people will join them. Debt is being redistributed from the poor to the rich, its not fair, its not acceptable and we have had enough. The ones below are mainly for the USA. Dec 1, 2011 ... Bank of America, JPMorgan Chase, Wells Fargo, Citibank, Ally Financial are all targets of the lawsuit. Nov 5, 2011 ... Even if this is the first you've ever heard of Bank Transfer Day, you can still participate! Any day is a good day to take back your money.